Superbooth may only be in its second year, but it’s already a mainstay of the music tech calendar. Following last year’s inaugural event at the Funkhaus Berlin, we immediately asked Andreas Schneider if 2017 would see the music tech fair return, to which the answer was along the lines of ‘yes, but we’re not sure where yet’. Fast forward eight months and the announcement was made that Superbooth was returning to Berlin for 2017, but not at the Funkhaus. This time the FEZ, a kids' leisure centre and music academy, was the chosen venue to host the show from 20-22 April. On entry to the the FEZ, you are met with wafts of the sort of esoteric sound design you'd expect from such a vast collection of modular manufacturers, nestled alongside your more established synth and tech companies. One thing should be said of this cacophony, though: at least it’s not interspersed with trumpets, drums, accordions and the like, as is common at some other well-known trade shows. In fact, your average trade show Superbooth isn’t. It has tried to distance itself from the vast swathes of distributors, retailers and trade folk synonymous with shows like NAMM. Instead, the show throws open its doors to the public every day from 2pm, and features much more than just the latest gear, with a full programme of talks and performances also on offer. There's also a whole host of associated evening events being held around Berlin over the same weekend. However, you cannot ignore all the latest trinkets on display, and this year there were notable launches from well-known names, too. So, without further ado, let's take a look at some of the new tech that was on display at this year’s show. It would be rude to not start with Novation’s new behemoth, Peak. The eight-voice hybrid poly certainly turned heads at the show, and for good reason. Hooked up to whopping big set of KRK 10-inch monitors (somewhat larger than your average booth foldback), Peak definitely sounds the business. The desktop synth’s sound engine is based around three ‘New Oxford Oscillators’ which come courtesy of consultant Chris Huggett, the synth design stalwart behind Wasp and OSCar. Peak is priced at £1250 and should be available very soon. Be sure to check back soon for a full review. In the meantime, check out the Novation website for more information. Not ones to just launch one new product (something of a common theme as other manufacturers proved, but more on that later) Novation also dropped another analogue-based beauty. 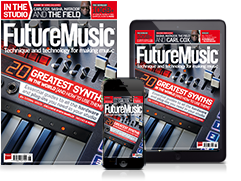 The UK firm has turned its attentions to the immensely popular Circuit synth, and given it an injection of the same stuff that powers the Bass Station II. The paraphonic Circuit Mono Station features three sequencer channels based around those found in the original Circuit, and since its synth is paraphonic, two of these can be used to sequence its oscillators separately. Mono Station is priced at £480 and should be available at the end of May. Be sure to check back soon for a full review. In the meantime, check out the Novation website for more information. Another flurry of activity was spotted on the Behringer booth, where the Music Group brand launched not one, not two, but three new products. As promised, even prior to the original launch, we got the desktop version of the DeepMind 12. Obviously the keys have been dropped, but a polychain feature has been added, so you can chain multiple synths together. The internet was awash with speculation as to what else was coming at the show, but the DeepMind 6 was not predicted. This shrunk down, 27-key version features just six voices, but the same effects engine as its bigger brother. The DeepMind 12 desktop and the DeepMind 6 are priced at $899 and $699 respectively. Moving away from the DeepMind brand, we had the official announcement of the new Moog Model D emulation. Taking on a form-factor not too dissimilar to that of Roland’s Boutique range, punters will be delighted to know that it should retail at around $399. We can’t wait to test one out and compare it to the real thing. The Jomox booth was constantly surrounded by enthusiastic synth-heads, all vying for a peek (and a listen) to the all new Alpha Base. Jomox founder Jürgen Michaelis revealed the brand new drum machine, which is all-analogue and built totally from scratch. It features 11 instruments, a sequencer, MIDI and USB I/O, an SD card for storing samples, sampling inputs and balanced individual outputs. The Alpha Base is priced at €1699 and we hope to have one in for testing very soon. More information can be found on the Jomox website. Italian manufacturer Grp Synthesizer was on hand to show off two new products at the show, the A2 synth and R24 sequencer. The beautifully-crafted and knob-encrusted A2 features MIDI and CV/Gate connections, and VCOs with five waveforms, including Super Saw and Super Triangle. You’re also getting a variable-state 12 dB filter, ring modulator and a pair of envelope generators. You’d be hard-pushed not to be impressed by the rather alluring VU meters on the output stage, too - what’s not to like? As for the R24 sequencer, well, you’re treated to more toggle switches than your average airplane. The R24 is flexibly configured in either 8 x 2, 16 + 8 or 24-step sequencing modes. The R24 has an obscene amount of options, and each step can be rhythmically repeated in “Ratchet Mode” by selecting X2 (simple bounce), X3 (triple bounce) or Off (no bounce). Every bounce/ratchet mode works at double or triple speed. The A2 is available for €1200, while the R24 is yet to be priced. More information can be found on the Grp Synthesizers website. A few manufacturers had two positions at the show, and Elektron was one such company, whose room on an upper floor was constantly rammed with people trying to get a butchers at the new Digitakt drum machine. And just like them, we wished that there were more units on show to play with. Down in the entrance area to the FEZ, smaller booths looked to act as mini-adverts for some brands, with Elektron taking the opportunity to show off some cool functionality of their hardware with arcade booths set up for some retro gaming. Our favourite was Octapong, a slight twist on the classic pong, utilising the Octatrack’s crossfader. Handcrafted in Denmark are Gotharman’s Musical Instruments, which took to Superbooth with a brand new mini modular synthesizer called the aNamoNo Xmini. The synth features enough memory for up to 47 minutes of sampling time, an exchangeable analogue filter, a sampler, sequencer and granular effects. We’re huge fans of Paul Soulsby’s 8-bit Atmegatron synth, and not just because it spews forth some lovely crackly, lo-fi, digital noise. It's also been expanded with several updates, which include a drum machine and a twist on the old ARP Odyssey. A perfect time, then, to introduce a limited edition version designed by none other than Pete Fowler of Super Furry Animals fame. There will only be 30 units made, and each one will be numbered, signed and bundled with an Atmegatron accessories pack. To get hold of one, you’ll need to form an orderly queue, as it launches on 1 May 2017 and will probably sell out rather fast. It’s not all about the standalone synths, though, as the versatile Oscitron module (a Eurorack version of the Atmegatron) now features new accessories that include Odytron and Oscidrum expansions. Nestled in between the Oscidrum and Oscitron modules in the above picture is another new module, the AT-ARP. Featured in the 2HP module are 16 Atmegatron patterns, plus 16 editable patterns and V/Oct and Clock inputs/outputs. For more information, check out the Soulsby Synthesizers website. We first saw the Data Duo launched as part of a Kickstarter campaign in the summer last year, so it was good to see the guys roaming the halls of the FEZ inviting all and sundry to have a fiddle. On one side, the wedge-shaped, collaborative two-player synth features a two-oscillator synth, low-pass filter, envelope and sample-rate reduction. The reverse side includes an eight-step sequencer and a two-octave pentatonic keyboard. You can pre-order a Duo now for €329, and more information can be found on the Dato website. Possibly one of the more intriguing products on display was the Joué controller. We’ve seen the concept of MIDI controllers with rubber overlays before with the Sensel Morph, but we were really impressed with the level of gesture manipulation on offer here. Each overlay has presets saved within, so as soon as you drop the silicon cover onto the controller, it will open your chosen virtual instrument and desired preset for instant manipulation. Equally impressive was the fretboard-shaped guitar controller with very realistic bend functions, but perhaps the most intriguing elements were the small dome-shaped knobs that allow for very tactile XYZ control with aftertouch. The Kickstarter campaign was fully funded earlier this year and it's hoped that full production will commence in the summer. We hope to have one in soon for review, but in the meantime you can check out the Joué website for all the latest news. Although there was nothing new from the Asheville crew, it's always a pleasure to take hold of a Model D, a Mother-32 or even a Model 15 for a spot of sound design meandering. In fact, the same could be said of every booth at the show - it’s easy to get lost in the moment. Unfortunately, time was not on our side, so we had to break off mid-flow and move on. Taking up residence in the ‘space-rocket’ room of the FEZ was Arturia, which was displaying its brand new black range of controllers. The BeatStep, BeatStep Pro and the KeyStep have all taken the new livery and were joined by the updated KeyStep range and the mother of all modulated mono synths, the Matrixbrute. If you fancied taking a spin on a gyroscope ride at Superbooth, then the Roland booth would have been your preferred destination (there were two in attendance, no less). All of Roland’s latest wares were on display, including the System-8 and flagship DJ controller, the DJ-808. Another big-name player to have decamped its entire tech offering from Musikmesse to Superbooth was Yamaha, which had a packed programme of live streamed shows, but there was one thing that caught our eye that we couldn’t ignore. The Refacerobot was as impressive as it was bonkers. Underneath all of the motorized tendrils was a humble Reface CS, which, due to its interface design of slider controls, was the perfect centrepiece for the collaborative project between Yamaha and Anno Labs. Unfortunately, there will only be 100 units of what will most likely be a rather popular remake of this Russian classic. The limited run is due to the low number of components available today, so when they say there’ll only be 100 made, they really mean it. If you do find yourself in the market for one, but you're not quite up to speed on your cyrillic alphabet, don't worry as the makers have printed a handy cheat-sheet on the underside of the synth. XOR Electronics has taken its Tracker-style standalone Nerdsynth groovebox into Eurorack territory with this 32HP module, called the Nerdseq. A Eurorack expander module for the individual synth cartridges has also been made available, with the promise of more synth clones to come in the future. Leaf Audio’s DIY kits were on display for some electroacoustic experimentation. Armed with various objects, such as stones and a bow to excite the various nodes and surfaces, a veritable cacophony could be extracted from this particular setup. Also known for its DIY kits, Eowave launched a brand new standalone synth called the Quantrantid Swarm at the show. The QS is made up of a digital synthesizer voice with a percussive element. It also features a two-pole analogue filter, an LFO with eight waveforms, and a spring reverb. The eight touch keys can be used as a mono keyboard, polyphonic keyboard or an eight-step sequencer. Eowave describes the unit as being ideal for “musicians looking to explore exquisite and unfamiliar timbres that range from subtle to outrageous, nebulous to shimmering.” They’re not wrong on that score. The Quandrantid Swarm is yet another beastly little instrument that you can get entirely lost in. It is hoped that production will begin towards the end of summer, and we have our fingers crossed that it won’t be delayed. In the meantime, join us as we head over to the Eowave website to drool some more. Alternatively, you can check it out in the video below. Following on from the announcement of version 2 of Bitwig Studio earlier this year, Bitwig were showcasing the latest iteration of the DAW's modulation possibilities with a live setup consisting of, amongst other things, a loaded Waldorf kb37 and Elektron Octatrack. It’s only been a year since Urs Heckman took to the last Superbooth show to launch the u-he Repro-1, albeit in beta form. Roll on a year and roll on another beta synth. This time it’s the Repro-5; not just a pumped up version of the Repro-1, the polyphonic Repro-5 is modelled on the legendary Prophet 5 from Sequential Circuits. u-he has ditched the sequencer and added a few extras, including a unison mode and distortion on each voice. Well known for being built like one (the tank that is), the Sherman Filterbank 2 has taken on a new form. Gone is the wedge shaped form-factor, in favour of this trimmed down, flat desktop affair.